I took leave from work for the first time in nearly a year in order to visit with wednesday_10_00, who came over to stay with me for spring break. 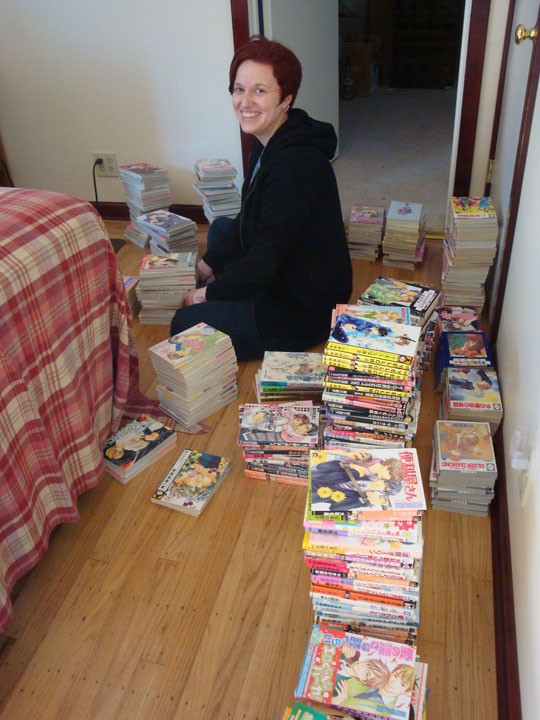 She arrived on the 21st, and then amid bouts of discussion and TV watching we got started on the huge job of organizing my manga collection. We spent a large part of the day on the 22nd doing the same, though we did take a break to walk to town for some shopping. On Saturday morning we were joined by two other friends, and we all set out to attend the San Francisco Flower and Garden Show (which, despite the name, is held here in my town). We had a good time viewing the model gardens and browsing at the vendor stalls. We were all talked into buying stove-top grills, though the vendor giving the demonstration could have been more flexible with his patter. (Even after I said we would only use it for fruits and vegetables, he tried to get us to try the grilled chicken. Hint: Chicken is neither a fruit nor a vegetable.) I also bought a couple of herbs, and I was unable to resist a new tomato plant (an intensely dark variety called Indira Gandhi from Love Apple Farm), despite my resolution only to grow yellow and orange tomatoes this year. On our way back, we stopped at the grocery store and picked up some fresh vegetables to try out on the grill. Then we came back and had a lovely meal with the grilled vegetables and some potato salad, accompanied by a jar of my homemade pickles. We also had a platter of cheese and crackers. One cheese that went over well was gjetost, which I picked up as an experiment after having read about it in one of my cheese-making books. On Sunday, mangaroo came over to hang out and play games. We cooked up a potato feast consisting of potato/parsnip/artichoke soup (using artichokes picked fresh from my garden), cheesy potato casserole, potato/mayonnaise pizza, and curried potato pizza. Every single menu item was terribly delicious. Monday, wednesday_10_00 and I took the bus to San Francisco and headed to Japantown, where we browsed in several shops. We spent quite a while in Kinokuniya studying Japanese tourism books in preparation for our winter trip. On our way back, we barely made it to the bus stop in time--which is a big deal, since the bus only comes once per hour, and it was unexpectedly chilly that day. If the bus hadn't stopped at a traffic light, we wouldn't have caught it. mangaroo came back on Tuesday for another day of board games and TV watching, not to mention eating the remnants of the potato feast. (We made a SERIOUS amount of food.) We played a game called Shadows over Camelot, which is a cooperative game that is much more difficult to win than we had anticipated. Though we played three times, we only won the third time--and that only by a hair. I had to say goodbye to wednesday_10_00 on Wednesday. ;_; It was a great week, and I'm looking forward to the next time we get together. I did keep a quote list, though I wasn't as prompt about writing things down as I had intended. In any case, here is the list, with quotes from the participants mentioned above plus input from sara_tanaquil via TeamSpeak. You don't want to be alphabetizing while drunk! I should go read your tomato thing. What do you call it--the Tomato Diaries? Okay, I think I'm done being me. I'm going to sparkle at you. You can't shoot me. Somebody get a pole. I'm going to dance. That was an amazing psychic snack moment, there. It's good to be in love with something and then get to grab it. I paid $20 for the privilege of walking uphill. Oh, my God, we have an artichoke harem. I'm kind of concerned. I have not seen my head in quite a long time. You're apparently confused about how eating works. You are doing such a good job drunk with the cheese. I'm so stuffed, it's kind of like being drunk. It's some kind of glitter-induced lung disease. Victory for psychic BL reader! I think she's making the cheese from scratch. It was a well-founded fear. Look, I just turned Finnish. It happens. • Forbidden Island - This is the first truly cooperative game I've ever played, and I loved the experience. The rules and order of play are straightforward and easy to pick up in a single round of play. The playing time is perfect for a casual game (at just 30 minutes, I wouldn't hesitate to propose the game even if I was worried someone in the room was feeling lukewarm about games in general). The art is reminiscent of Myst, and the pieces are pretty. The only thing I would like to see is more of a story. Of course, games with stories typically have longer playing times and more complicated rules, so it's a tradeoff. The other thing I thought I wanted in Forbidden Island was treachery. No, seriously. I loved the open, cooperative gameplay, but I enjoy a layered challenge. Last time we got together, spacealien_vamp and I had visited a game store and showed me Shadows Over Camelot, a cooperative game with (the possibility of) a mole in the players' midst. So, naturally, I wanted to try that. • Shadows Over Camelot - In my opinion, there is nothing intuitive for the first-time player about the game board and the rules for Shadows. All those pieces and cards and 4 different kinds of challenges and…I think it took as long to read through the rules as it did to play the first round. Which we lost. By that time, even though I felt we had a good grasp of the rules and order of play, I felt there was something wrong with the pace of the game. I don't know how to describe it: except when a quest ended and players returned to Camelot to distribute rewards/penalties, I never really "felt" when a player's turn ended. So I announced it every time. Shadows also suffers in comparison to Forbidden Island in terms of cooperation. To facilitate the possibility of having a traitor, the gameplay isn't open, and -- except when you're on a shared quest -- it isn't really cooperative. For example, you can't exchange cards to help another player unless you're playing as the one character with that special ability. In addition, unlike Forbidden Island, it is possible for a Shadows player to die before their fellow knights, at which point there's nothing to do in the game. So while the rules declare you are included as a posthumous victor, that doesn't help if you've got nothing to do for 30-40 minutes while your companions continue to play. What I do love about Shadows is the challenging, unpredictable gameplay. As s_vamp said, it was quite a challenge to win playing in novice mode. I hope to play with a traitor someday. I only wish I had the room in my luggage to bring a game to Japan so we could all play there. As part of our trip planning, can we brainstorm games that don't take up space? Deck games rather than board games? Lastly, it was great to spend to spend time with friends and see Sara's WoW character. I feel like I want to bookmark this post for your in-depth analysis of the two games. Thank you! As part of our trip planning, can we brainstorm games that don't take up space? I can bring my Back to the Future card game, which is fun and very tiny. I'm also hoping I can find a way to make the Kickstarter game I backed (Machine of Death) portable--that is, it will come with a zillion cards, but I hope I can find an amount of cards I can bring that will be reasonable to pack but still fun to play--because I really, really want to play it as Machine of BL: the Game of Creative Matchmaking. Another possibility would be any of the Fluxx games; I've only played Zombie Fluxx, but I think they're all just small boxes with decks of cards, making them very portable. I can bring Once upon a Time, which was fun the last time we played it. I looked up other card-type games, and a few seemed intriguing. Lost Cities gets good reviews. It's a 2-player game, but apparently there are rules for 4 players (though I think you have to buy two copies of the game for that to work). Citadels is a game where players have different roles with special abilities. It seems pretty compact. Race for the Galaxy is a civilization-building game ranked #19 (out of thousands) at the Board Game Geek website. Dominion is a deck-building game that ranks #15 at Board Game Geek and has rave reviews at Amazon. This is pathetic. I went to Games of [whereIlive] to do a game portability assessment based on original packaging, and of course s_vamp's Amazon links provide that information. Oh, well, at least it got me out of the apartment on a Saturday. I tend to hibernate on Saturdays. Fluxx wins at portability. The store clerk recommended the Zombie version. W_10_00, would you prefer we try a different flavor of Fluxx or are you okay with more zmobies? Zombie and Star are the most interesting to me based on the 4 sample cards on the back of the boxes. Personally, I would not be willing to pack either Dominion (11.8 x 11.8 x 2.9 inches ; 2 pounds ) or Race for the Galaxy (10.8 x 7.5 x 2.8 inches ; 1.7 pounds). It's too bad, since they are so highly rated, but portability counts for as much as playability here. Edit: if anyone else makes the commitment to bring either of these, I will insist we play the game just to honor that person's effort. I am most amused by the mention of Forbidden Island, which I also have and force everyone to play with me because I love it so much. mordath and I played this in VA last year for the first time and we had many hilarity-bound moments, including one of my now-all-time-favorite quote list quotes. I literally came home and bought it the next day for myself. One of my semi-local friends here likes it too though we are clearly not as compatible because we seem to have a hard time winning. Or maybe we are just so overconfident we take stupid risks. Also, she has terrible luck of the draw. Damn that waters rise card. Anyway, I'm glad other people have this game and love it because it is super fun! I have been gathering a small arsenal of cooperative/competitive/creative games over the last few years and desperately hope that maybe someday I will have enough people over at the same time to play them. (I also backed the Machine of Death game, W_10_00 mentioned!) I wish my game-playing friends weren't all located in other states. Anyway, sorry for butting in. :P I am so behind on LJ, or something. I wish my game-playing friends weren't all located in other states. This! Also, I think it's hilarious that I spent my idle head time today pondering how to make Forbidden Island competitive and antagonistic. Seriously, I loved the cooperation and open play and the safety net of all win or all lose. Nevertheless, I can't stop being nefarious. I think it's hilarious that I spent my idle head time today pondering how to make Forbidden Island competitive and antagonistic. Do you think you would be interested in trying out Myth with me when it comes out next year? I don't know how you feel about games with lots of miniatures and dice. It sounds like everyone had a blast <3 glad to hear you took some time off and had fun! Yeah! Sounds like everyone had fun!! Yay! We had fun! Next is my birthday party? The gjetost fondue looks kind of amazing! I'd love to try that sometime. Next is my birthday party? The gjetost fondue looks kind of amazing! Yeah, I would never have thought of it myself, but it looks like a good idea. I read the article on gjetost - fascinating! Was it hard to find or does the average non-Norwegian supermarket have it? Your potatoey feast sounds awesome! So does the new tomato variety! I like the idea of a cooperative board game (I think it is because I often have the urge to let other people win in competitive games.) It's the reason I loved the Lego Star Wars video game... everyone works together, no one dies, yet it is still a clever challenge. Okay, I'm curious. Where are you going in Japan that you two need to consult a tour book?? Was it hard to find or does the average non-Norwegian supermarket have it? I got it at the foodie grocery store downtown, so I don't know about regular supermarkets. The article says it's available at Whole Foods. Where are you going in Japan that you two need to consult a tour book?? We want to try an overnight excursion from Tokyo, so we were looking for examples of places near enough that they could be reached in a couple hours yet that we hadn't all been to a bunch of times already. cute hair! Love the color! Thanks! It's been like this for about six months, I guess? But to be honest, I'm already getting kind of sick of having to cut and dye it so often, so I'm probably going to start growing it out soon.